A new exclusive partnership for cycling locks and helmets in the UK. ARCHIVES Digital editions of the magazine are available to view on ISSUU.com Recent back issues of the printed edition may be available please call +44 (0)203 143 8777 for more information. Looking to the horizon In our last edition, I spoke of how, as Brexit negotiations rumble on, it becomes more and more arduous – excruciating, even – to continue formulating fresh thoughts on a process that now appears so utterly tedious it beggars belief. That’s why, as Theresa May continues to stumble around parliament, postponing all meaningful decisions and posing as the living embodiment of uselessness, I’m opting to focus on an event that can channel considerably more positivity for our industry. On 12th September, the BikeBiz Awards will be returning to the Cycle Show at the NEC Birmingham. Now in its 11th year, the BikeBiz Awards celebrate the UK cycle industry and the people and companies whose hard work behind the scenes keeps the cycle world’s wheels turning. Following visitor feedback, we are relocating to the Cycle Show, not only to meet ticket demand, but to ensure the BikeBiz Awards take place in the most convenient, feasible location for our attendees. The Cycle Show continues to grow impressively every year, and pairing the Awards ceremony with the show’s after-party will place our winners and nominees exactly where they should be: at the heart of the cycle industry. More details about this year’s Awards, including tickets and the nomination process, will be available in the near future. Watch this space! All contents © 2019 Biz Media Ltd. or published under licence. All rights reserved. No part of this magazine may be used, stored, transmitted or reproduced in any way without the prior written permission of the publisher. All information contained in this publication is for information only and is, as far as we are aware, correct at the time of going to press. 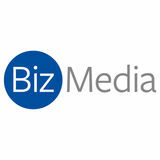 Biz Media Ltd. cannot accept any responsibility for errors or inaccuracies in such information. You are advised to contact manufacturers and retailers directly with regard to the price of products/services referred to in this publication. Apps and websites mentioned in this publication are not under our control. We are not responsible for their contents or any other changes or updates to them. This magazine is fully independent and not aﬃliated in any way with the companies mentioned herein. If you submit material to us, you warrant that you own the material and/or have the necessary rights/permissions to supply the material and you automatically grant Biz Media Ltd. and its licensees a licence to publish your submission in whole or in part in any/all issues and/or editions of publications, in any format published worldwide and on associated websites, social media channels and associated products. Any material you submit is sent at your own risk and, although every care is taken, neither Biz Media Ltd. nor its employees, agents, subcontractors or licensees shall be liable for loss or damage. We assume all unsolicited material is for publication unless otherwise stated, and reserve the right to edit, amend, adapt all submissions. complete Ac omplete go-fast go-fast ssystem ystem that that boosts boosts speed speed everywhere everywhere you’d you’d expect. expect. And And a lot lot of of places places you you wouldn’t. wouldn’t. Climb Climb faster. faster. The T he llong ong awaited awaited SystemSix SystemSix is is the the fastest fastest UCI-legal UCI-legal road road bike bike on on the the market market today. today. he Netherlands, a land famed for its love affair with cycling, has captialised on the benefits of e-bikes, selling them at a one-to-one ratio against traditional bicycles in 2018. Is it time for the rest of us to catch on? Are e-bikes the future, and more importantly, are they actually good for health? Here are my personal experiences. Having founded Gocycle in 2002, I have been at the commercial and development coal face of the e-bike industry for more than a decade. I truly believe they are the perfect solution for living healthier and more sustainable lifestyles. Personally, I have been riding e-bikes for nearly 20 years – be it for daily commuting, running errands or simply fun – and I still love riding them today. I live close to my place of work – it’s around four miles each way. Most days, I’m able to commute to and from work as well as being able to make it home for lunch, and this is only possible because I ride an e-bike. We all experience work pressures, personal commitments and hot weather conditions, where commuting can frankly become a chore on a traditional bike. Electrical assist allows you to ride consistently – it makes getting out the door much easier, which is half the battle in staying active regularly, and especially with cycling to work in the early morning. Anything that reduces the barriers to get moving can only be a good thing, and e-bikes indisputably offer that. Higher usage Over time, I’m confident I’ve burned more calories and maintained my fitness level to a higher standard than if I was commuting on a traditional build. Prior to starting Gocycle, I commuted by a nonpower bike – a single speed diamond tube frame. Despite its simplicity, convenience and its lightweight build, I just don’t believe I would be commuting as regularly as I have done on my Gocycle e-bike. It is not an altogether common occurrence, but those occasional times where you are tired, run down and have a 20mph headwind (seemingly both ways!) may make you decide that the experience was just too negative to continue, and the pattern will break. On a Friday, for example, you will think to yourself: ‘I’m not doing that again’. Monday arrives and you decide to have a few weeks off. On an e-bike, that Friday morning commute will be a breeze, seemingly with a tailwind both ways, as the motor takes the strain. You’ll get to work on time, ready to tackle the day, and ready to cycle to work again on Monday. But it’s after a short break when an e-bike will really show its value. With a non-powered bike, your first commute into work after a two-week break will be hard. We all know the horrible equation: it seems to take two to three times longer to get your fitness back than the amount of time you took off in the first place, and that’s a huge barrier to getting back in the saddle. But with an e-bike, your first commute after a break will be a positive experience. You’ll get to work in a similar time and you’ll feel really good about getting back out there and not succumbing to lethargy. In the long-term, e-bikes are simply easier to live with and they become a bigger part of your lifestyle, which results in a more active lifestyle on the whole. They become a part of your life in a way that traditional bikes – for many people – never can. E-bikes have the distinct advantage of enabling you to get from A to B, if you choose to, with very low effort/output. As they say with non-powered bicycles, ownership is high, usage is low. We spend too much time beating ourselves up over sticking with a fitness programme, and that inevitably leads to a stop-start regime. The e-bike is your trusty steed, patting you on the back and encouraging to get you back into the swing of things. If you don’t feel up to it, it will take the strain for the first half of the journey. Nine times out of ten, once you get moving, you’ll up your heart rate regardless of the help you’re being given. Electric commute It’s worth noting that commuting on two wheels can be stressful as well as dangerous (though driving or being stuck in traffic comes with its own type of stress). However, I have noticed a distinct difference in the feelings you have when arriving at your destination, be it work or home, between using a car or e-bike. The latter provides a sense of achievement, a feeling that you don’t need to go to the gym, that you’ve done your small part for the planet, and the mood boost you receive from natural endorphins. Arriving home or at work by car is usually a feeling of relief. Relief that you arrived on time, having just missed traffic, or if not, the relief of finally getting out of your car but ruing the time you have lost. In my opinion, stress levels when commuting are reduced when riding an e-bike instead of a traditional bike. There are many times where the added power allows you to keep up with the flow of traffic better, or enables you to accelerate into a safer gap or stay ahead of a lorry behind you. E-bikes are more flexible in this area and for less fit or powerful riders, they could quite literally be a lifesaver. Some more solid research needs to be carried out, but in my opinion, across a wide range of abilities, e-bikes are surely safer than traditional. Ride happy When someone is considering purchasing an e-bike, I always point out that you will ride in exactly the same way you always have – you’ll simply get there quicker, travel further and have more fun! A recent Norwegian study highlighted in The Telegraph appears to corroborate this viewpoint. How much effort you put in is based on your personality, not whether you have a motor or not. Riders on normal bicycles used about 20% more energy than those on e-bikes, but the e-bikers got from A to B 20% faster. Most people would see that as a pretty reasonable trade-off. Also, when you consider that you’ll use the e-bike more over the longer term because it is more fun and more practical than a car – for short errands, for example – it’s clear the e-bike has the credentials to become the de facto commuter and recreational two-wheeler of choice. These days, we are even seeing e-bikes cropping up in the road bike segment. I had previously believed that this was many years away, but I’m certainly not complaining – they make perfect sense as a great way for more riders to keep healthy. Consider those riders who are injured, or, for whatever reason, are unable to keep up with the Sunday group ride. Rather than giving up and spending weeks/ months building up your fitness alone, there is now an option to keep doing what you love, having fun and staying fit. And with all the modern stats you get with cycling these days, it will still be easy to compare power output and calories expended so all in the group can maintain credibility among their peers. Another area that e-bikes will show promise in is rebuilding fitness and mobility for those who have been treated for heart disease. Normally, patients treated for these conditions will not be allowed to drive for a certain period of time. E-bikes offer a credible transportation option, allowing the rider to avoid exceeding safe limits of exertion. Michelin brings its incredible research and development resources to make the best-rated and ultimate performing bicycle tyres and tubes for all market segments: racing, e-bike, road, gravel, cyclocross, urban, kids and a full range of MTB disciplines from cross country to enduro. DON’T DON’T GET GET DROPPED DROPPED ®®® Clean Clean Clean smarter. smarter. smarter. Smartwasher Smartwasher Smartwasher offers offers offers superior superior superior bike bike bike cleaning cleaning cleaning ininin aafraction afraction fraction ofofof the the the time time time and and and cost. cost. cost. ®®® The The The Smartwasher Smartwasher Smartwasher could could could be be be the the the most most most proﬁtable proﬁtable proﬁtable tool tool tool ininin your your your workshop. workshop. workshop. ItItmakes Itmakes makes our our our job job job much much much easier easier easier because because because we we we can can can clean clean clean a awhole awhole whole bike bike bike twice twice twice asasas fast fast fast asasas our our our previous previous previous spray spray spray and and and rag rag rag method. method. method. We We We wouldn't wouldn't wouldn't be be be without without without it!it!it! e believe it’s your choice to wear a helmet. Disclaimer – Iain came from NZ, a country where it’s compulsory, by law, to wear a helmet while riding a bike/cycle on a public road, since 1994. Iain didn’t get his first bike until he went to high school. He was 12. It was a royal blue, handlebar mounted two-lever, ten-speed Healing Clipper. He soon hit the upgrade section at the local bike store. His first purchase was a spring-controlled dial speedo that ran off the front wheel like an old school dynamo light. At the time of writing, Iain is heading towards his 43rd birthday. That means that for a few of his early years, he didn’t have to wear a helmet – that’s if he had a choice. He didn’t. The rule in his house was that if you ride a bike, you wear a helmet. And that was that. Surveys say that if you put a helmet on a rider’s head, rather than a baseball cap, they will behave differently. They inherently take more risks, and this is the case regardless of gender, age or situation. Iain soon learned from his science teacher that if he was going to get to, and just past, the magical 50kmph (30mph) on the flat (the NZ speed limit for town roads) that 90% of his energy was going to be combatting wind resistance. This then meant he had to find the smoothest and straightest nearby street. Britannia Street it was. Newly asphalted, black, oily-smooth, runs with the prevailing wind (or into it, depending on where he started) and not very busy. He tried, and tried, he pushed and pumped. Still days, tailwind days. He eventually got there. He broke the speed limit on his 10-speed. Would Iain have done this if he wasn’t wearing a helmet? He doesn’t know! He didn’t know differently. But probably, if you had to push for an answer, yes!? Once the 50kmph had been knocked off, a lot of his after schools were then spent slogging up the ‘Wainui’ Hill (or the Korokoro, Maungariaki, Normandale, Harbour View, Tirohanga Hills) just to turn around and see how fast he could go on the way down. He eventually got confident, and good enough, that he had to time his runs so that there was a break in the traffic and he knew a car wasn’t going to hold him up. He could go faster than a car! He did have tears streaming from the corners of his eyes, chest on his seat, wobbling knees, but he could hit 75kmph reasonably often. Would Iain have done this if he wasn’t wearing a helmet? He doesn’t know. He didn’t know differently but he probably would have. Between riding on the road and off it (trying to improve his MTB skills) Iain had had his fair share of ‘offs’. His last road crash was his fault, he completely misread the road. usion is a 20-year-old Danish high-performance sportswear brand with a difference. It is offering a unique proposition for UK retailers, that it feels is different from the current competition, and something that provides solutions to the current market challenges UK cycling retailers face. In this time, Fusion has built a successful brand and business that works with its retailers, on the principle of regular reordering rather than large six monthly seasonal preorders placed months in advance, which end up all landing at the same time, putting strain on cash flow. “Fusion products are produced to the highest standards in Europe, at its own company manufacturing facility using only European-sourced, high-quality materials,” Jamie Hawthorn of Fusion explains. “This enables Fusion to control production 100% and offer a completely flexible, highly efficient supply chain that delivers excellent stock availability to our retailers all year round with no overproduction, waste or stock risk. “We are focused on producing the right product at the right time that our retailers can reorder when they need to. The Fusion range does not change every season, but continues to offer established best selling products all year round. At the same time, it has an ongoing product development programme, whether this will be ongoing enhancements to an existing product or developing something new. It does not feel the need to define its products by the production or range year, which it says is typical with the current industry and has been led by the need to produce completely new autumn and winter and spring and summer products, with no range continuity. This means retailers receive only large orders, which when not sold need to be cleared quickly at low or zero margin, or at a loss to get ready for the next inbound seasonal pre-order. Fusion formed in 1999 in Aalborg, Denmark, and through manufacturing precision, use of high-quality technical fabrics and a constant drive to be innovative, it has forged a reputation for making durable, functional and cutting-edge products. Fusion says it constantly strives to ‘push the boundaries’ in the development of new products, with a dedication to continually exceed the needs of customers that is only matched by its customers’ own dedication to their chosen sport. Hawthorn explains: “Fusion in Denmark has doubled its sales turnover during 2018, however, the level of stock held at the Danish HQ warehouse has been halved due to our production flexibility and constant replenishment of key best sellers. This is further proof that our highly efficient supply chain system is ensuring we are stocking the right products in the right sizes and at the right times.” In early 2018, Fusion partnered with Upgrade Bikes, which is a wellrespected distributor in the cycling industry with successful brands and an excellent retailer portfolio, Hawthorn says. He continues: “It was not only the attraction of the quality product within the Fusion range but also how we do business. Upgrade has historically never considered adding a clothing brand to its brand portfolio, but the Fusion proposition presents it with a clothing solution that does not require it to place six-month pre-orders in large quantities, all held in stock with high stock risk. whatever â&#x20AC;&#x201C; the weather. Ready for whatever the weather can throw at it and capable of carrying all you need at the same time. Zwift, at its core, is an online training platform for cyclists, that links up with your smart turbo trainer to offer structured workouts. Pretty simple right? But where Zwift truly stands out is in its ability to connect users who ride side by side in an ever-growing virtual world. Indoor training has existed for decades, hitting a new phase in the 1980s with the birth of spinning, which continues to be a popular institution of the modern health and fitness industry. Britain’s first ever Tour de France winner, Sir Bradley Wiggins, recently recalled his 13-year-old self slogging away in his London home using a turbo trainer and listening to a Walkman when his mum wouldn’t let him out to train at night. And now his son Ben is following in his footsteps. “My son, for example, wants to be professional,” Wiggins recently told a gathering of cycle industry bods at the launch of Zwift’s new pro racing league. “He comes home from school and rather than go and play Fortnite until 3am, he goes on Zwift now. We’re happy because he doesn’t have to go out in the dark. “It’s also the connections they make – one of his best mates lives in London and they hook up and meet each other to go riding, which is amazing really.” The inspiration behind Zwift, as set out by company CEO Eric Min, is something all cyclists can relate to. Speaking at the same event as Wiggins, held in the central London Pinarello store in January, Min said: “It all started in November 2013. I’d been a cyclist for ages and I relocated to London from New York and I just struggled to get outside. “What I missed was the social fabric of cycling and the racing scene in New York City where I’m from, so I soldiered on riding indoors, riding a turbo, something I was used to. What I missed was the social element. “All the tech was there, whether it was social network, Strava or gaming tech, and I thought, ‘why can’t we try to replicate even 80% of the social elements of riding, whether it’s competition or training or club riding? “For it to be successful it had to be at scale. You needed to have an environment where you could have a global community of cyclists. That’s how it all started.” In many ways, Zwift is the quintessential model of the 21st-century invention – you find a group of people, and you connect them in a way they have never been connected before. In Zwift’s case, you take cyclists who are serious enough to train indoors, but who are missing the social stimulus of riding, and you take them to their own world from the comfort of their sheds, bedrooms and living rooms. e-racing championship alongside a long-standing partnership with Zwift that will stretch beyond the Tokyo 2020 Olympics. British Cycling’s commercial director, Jonathan Rigby, said: “The eSports market is particularly exciting for cycling as it enables so many more people to participate and be active. “We are thrilled to be exploring this new territory with Zwift, to innovate in cycle sport. Its technology and our cycling expertise will together allow communities of cyclists to get more out of riding bikes for competition and for fun. We are also excited about what this could mean for identifying talent. “We are proud to have a wealth of gifted riders competing on the world stage and we are confident that Zwift technology will enable us to unearth more future stars.” Earlier this year, the British national virtual championships culminated in a live final between the top-ranked winners separated by ages and gender. Riders competed for a national jersey, much like pro riders. Moving forward, British Cycling’s interest in virtual racing will be motivated by two main prongs – participation and the Olympics. Last summer, the International Olympic Committee met with representatives of the eSports and gaming industries to discuss a potential future platform for eSports to be included in the Olympics. With debate raging about whether traditional video games are too violent to be included in the Olympics, virtual cycling could be the perfect medium between traditional endurance sport and the gaming world. British Cycling would hope to be at the vanguard of any new cycling-related Olympic discipline, in order to capitalise on past two-wheeled glory and do what it does best – deliver excellence. On the other side of the coin is participation. One of the key facets of British Cycling’s role in this country is to get as many people on bikes as possible, to get them active and keep them healthy. Through a combination of cycling education, mass participation events, advertising campaigns and support for racing, the governing body encouraged almost half a million people to get on a bike in 2017. And in partnership with HSBC, British Cycling is aiming to get two million people to cycle by 2020, so any new approaches will be welcome. Virtual cycling could be the doorway for thousands of potential cyclists, previously deterred by any number of factors – dangerous roads, time constraints or cycling’s often snobbish reputation. While Zwift is benefitting from the support of cycling’s biggest authorities, it is also looking to expand through its own initiatives. In December, the company announced it had secured $120 million (£91 million) in Series B investment to further invest in eSports and grow the running aspect of the platform. More than one million people had created accounts on Zwift at that point, with users logging more than 410 million miles. Amongst those million people are some familiar names, like British sprinter Mark Cavendish, the winner of 30 stages of the Tour de France. The Manxman said: “Zwift has transformed the way the professional peloton trains. Before Zwift, there is no way I would have chosen to ride an indoor trainer. Now though, I genuinely enjoy it – it appeals to the gamer in me. Riders like myself are genuinely fitter now, thanks to Zwift.” Cavendish’s endorsement marks the next step in Zwift’s evolution – the pros. In January, the online training platform launched the KISS Super League, a virtual race series aimed exclusively at professional riders. The ten-round series features 15 teams from the second and third divisions of pro cycling, including more recognisable outfits like Cofidis, Israel Cycling Academy and British domestic outfit Madison Genesis. Drawing in pros is essential for any cycling brand aiming at longevity - where the professionals go, the industry will follow. Just look at heart rate monitors, power meters and electronic groupsets, now widespread in the peloton and in turn filtering out to the mass market. Zwift is looking to be that next revelation, even bringing in the former head of marketing for the Premier League, Craig Edmondson, to bolster the professional edge. While launching the KISS Super League, Edmond said: “We’re not here to compete against the mighty backdrops of the Monuments and Grand Tours of pro cycling. “Our role is to deliver something brand new to cycling. By gamifying racing, we will create entertaining coverage and introduce an added dimension to bike racing. Team-based competition, power-ups, course ‘knowhow’ and the differences in racing physics make Zwift a new battleground for competition. Watts per kilogram is only one of many key factors.” Min added: “Pro cycling has embraced Zwift as a training platform and Zwift has proven itself as a talent ID platform for pro cycling. Now is the time to push on with eSports and in doing so build value for pro cycling. Our goal is to create a new sport within a sport, celebrated by pro cyclists, amateur cyclists and cycling fans all over the world.” Not only does Zwift hope to be home to a new “sport within a sport”, it has already been the springboard for amateurs to reach the top tier of professional cycling. Launched in 2016 as a talent programme for women, the Zwift Academy gives riders the opportunity to showcase their ability and even achieve contracts with professional teams Dimension Data and Canyon-SRAM. xford Products is aiming to be a one-stop shop, with the idea that a dealer can get everything they need for their store from one place, one company. From 26th to 28th February, the Oxfordshire-based company held an in-house trade show to display its products to interested bike dealers. “It’s the only way to properly represent what we do, because we can’t carry samples of all our products around,” marketing director Henry Rivers Fletcher says. “Shows aren’t that popular anymore. The shows that have been successful are probably consumer shows, and when you’ve got a full focus on the consumer it’s not for the trade so much. We’re sold on this concept, but we still do lots of shows. “This will just be available all the time for this kind of stuff. We’re still quite young in the IBD market, but not a lot of people know about it to just come here, so we have to start it somehow.” As well as its own product ranges, Oxford also had other brands it distributes on display, including Kali. It was recently added to sit alongside Acros components and Taya chains as exclusive brands, and founder Brad Waldron was on hand to answer questions from dealers. Commercial head of cycle David Jesson says: “We are certainly looking to enhance our third-party distribution offering as the year goes on. We have gaps in the catalogue that we are now actively looking to fill and we shall be looking at top brands to get behind. He also talks about the three-dimensional side of production, product engineering. “There is a bank of product category managers who will look after luggage, locks, electronics, hardware, workshop, all different categories of products, divided up amongst them. “We’re aiming to double our trade in cycling every three years” David Jesson Oxford Products “Then they’ve got to make the product come alive. Generally, their first port of call will be product engineering, so they’ll bring a product brief up from market demands, sales teams, customers, research into competitors. Extra, Extra, read all about it! Extra UK and ABUS formed a new distribution partnership in March. Stephen Hayes, Extra UK head of marketing, and John Harris, ABUS brand manager, talk good matchmaking and prioritising quality How long has this move been in the works? SH: Changes to long-standing relationships tend not to happen overnight, and contractual obligations needed to be respected. Our priority has been to ensure as smooth a transition as possible and to make sure that there wasn’t any loss of service to IBDs. We’ve been busy putting in place the brand management and marketing resources needed to ensure the success of the brand in the future. What attracted Extra UK to the ABUS brand? SH: Quality, first and foremost! Think of the best in bike safety and security and only a handful of names spring to mind. To have the opportunity to partner with the most innovative and established brand in the market was something we couldn’t refuse. We had gaps in our portfolio which are perfectly covered by ABUS and it is a very good match with the other premium brands in our range. What makes Extra UK a better fit for ABUS than other potential distribution partners? JH: We understand that historically, previous distributors have established a solid footing for ABUS in the market. 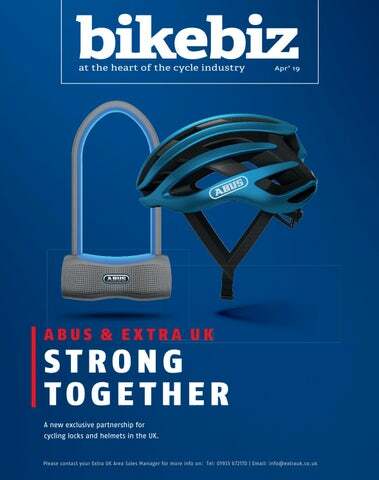 Given fresh enthusiasm combined with our sector experience, Extra is wellplaced to make ABUS the ‘go-to’ lock and helmet brand for the UK and Ireland again. We have a very experienced, passionate and driven sales team that will help to ensure the best sell-through, as well as showing some different angles on the attachment rate and upsell. The expertise that ABUS has in multiple industries is obvious in the quality of both helmets and locks. All product is engineered, designed and tested in Germany across its multiple sites. All of the lock production is still in-house in Germany – aside from a handful of UK specific products that are manufactured in ABUS-owned factories in the Far East. im Clark is retiring after 34 years of running his bike shop, Jim’s Cycles, based in Northumberland. This means he will close the shop, a decision that was made partly due to the rise in online sales. In a struggling retail environment where store closures are becoming all too common, he explains the impact the internet has had on his business. “A lot of it has to do with the retail side of the business, not so much the repair side,” he explains. “On the retail side of it, our figures over the last three to four years have dropped dramatically profit wise. The workshop mid-spring through summer is very busy, but it still doesn’t bail out the front shop. And that’s basically what happened to M Steel Cycles in Gosforth as well, and one or two other businesses.” M Steel Cycles, which had been trading since 1894, shut in 2017. Clark adds that he wants to issue a small thank you and dedication to Geoff Dobson, one of the former owners of M Steel Cycles. He continues: “Our suppliers need to start looking at their pricing structures. At the end of the day, they’re still making good money. And they’re very reluctant to start giving us better terms, if you want to call it that. If they don’t start giving us better terms, all the small bicycle shops and even the big ones are going to have no customers left. “A lot of it is to do with greed. They’ve had a monopoly for years, and so have we. But because of the internet pricing structure and online sites, our way of business that we used to have on a plate isn’t there anymore. We’re looking towards our suppliers to reduce their costs so that we can reduce our costs to the consumer, but it’s just not happening. We’re being drummed out of the market. Even I’m buying parts and spares off the internet, as some of the time, I can find an item cheaper. I feel embarrassed asking customers for certain sums of money when I know that if they went on the internet they could get that at a vastly reduced price. “The High Street has changed, retailing has changed and despite our best efforts, we find ourselves fighting to survive let alone thrive in our saturated Cambridge/world marketplace.” In November last year, the ‘oldest bike shop in Bath’, Johns Bikes, closed its doors to the public. It had been running since the 1970s. Even established bike shop chains have suffered, one notable example being Evans Cycles. In October last year, the retailer was sold to Sports Direct as part of a pre-pack administration, which resulted in the announcement that half of its stores could close. JD Sports Fashion and Halfords had also been in the race to rescue the struggling retailer, which traces its history back to 1921 when the first F.W. Evans Cycles shop opened on Kennington Road in southeast London. Clark continues: “There isn’t an overnight solution that’s going to fix this, unless some of the online sites start to go bust, and go under. We all know about Evans, and there are a few more that are struggling. Brand new for 2019, the Lazer Coyote is a clean and practical MTB lid that we’ve engineered to offer the best we can in style, performance ventilation, comfort and, most importantly, safety. The TS+ fit system provides comfort with all the adjustability you need and the bottom shell makes for a super clean finish. It comes in small, medium or large and with a MIPS version for just £20 more. An evolution of our awardwinning Forefront helmet, the completely redesigned Smith Forefront 2 is a full coverage helmet ideal for all-mountain riders who demand superior protection, ventilation and eyewear integration. For added protection, Koroyd has been extended into the back of the helmet to fully encompass the helmet. Internal air channels are combined with open intake and exhaust ports to maximise ventilation, while AirEvac channels promote airflow to prevent fogging of your eyewear. Improving protection and impact performance is the number one priority of the Alpinestars Vector helmet. Vector helmets are designed with extended coverage. The outer shell is made from a vacuum formed PC in-mold with EPS inner liner and is reinforced with a rigid internal frame embedded into the molded helmet. With the Vector Helmet’s inner size ring, riders are able to make easy snap length and height adjustments to improve fit. The Altona is much more than just a helmet. It is a helmet and glasses in one thanks to the integrated break-proof visor. It is available with and without Varioflex, the technology from Alpina, which ensures perfect visibility in all lighting conditions. The self-tinting (photochromatic) visor responds to UV light and darkens automatically. The light silver-coloured reflective surface reflects infra-red rays, ensuring 100% UV protection at all times. Introducing the next generation in kids helmets â&#x20AC;&#x201C; the IKON Full Face Helmet. Here at Kiddimoto we are very child-centric in all of our product development. Our IKON kids Full Face Helmet, in this bold blue and red colourway, provides unprecedented full protection when balance biking, cycling, BMXing or scooting. It is perfect for all little adventurers as the chin guard can be removed with one click, essentially making it two helmets in one. The Status Downhill/BMX helmet redefines the standards for what a mid-level full face helmet should be. Incorporating design cues from the championship-winning 100% Aircraft helmet, the Status offers elevated performance and comfort at an exceptional value. Available in five great colourways, as well as a youth version, all featuring ultra-light design, fibreglass shell and a padded polyurethane chin bar. The Status complies with ASTM F2032 and F1952, CPSC, CE, and AS Bicycle regulations. Street meets tech. At home on the dirt or in the streets, the Local blends classic skate style looks with new-school comfort and technology. The retuned shape fits closer and looks smaller, and the Local adds a cycling-style Action Fit system to a street helmet for a more secure fit. Hit the pump track, shred some vert, or rock it while youâ&#x20AC;&#x2122;re riding around town. For comfort and style, keep it Local. Let’s start with this: this isn’t your average bike helmet. The City is a purpose-built urban helmet featuring integrated drop-down eye shield and removable ear pads. The integrated airflow system provides maximum ventilation to make the commute to the office a pleasant one. Composite Fusion Plus technology incorporates multi-density cone shaped layers of EPS foam, and reduces impact G forces by as much as 25%. The Falconer II MIPS Helmet is a top-of-the-line helmet for fast-paced cycling. With an aerodynamic geometry developed to also provide extreme ventilation, the result is a quicker and more comfortable ride – all wrapped in our four-piece variable elasticity shell technology for great protection. Special features include STACC ventilation, easy adjustment with Occigrip turn-dial and comfort pads. The Uvex Finale 2 is the latest addition to the Uvex range. Lightweight at just 300g, bug nets, vented body, moisture wicking padding and adjustable peak are some key features. Safety is always at the forefront of product design for Uvex. The main structure of the helmet extends at the back for full support and the fit is fully adjustable. Available in two shell sizes with the option of a plug in LED, we think this is a real winner in the mountain bike category and beyond. The Vento is a new helmet concept from Catlike which concentrates on the fundamental pillars of ventilation and aerodynamics. The Vento incorporates an internal mesh of aramid, which reduces the weight and allows the ventilation channels to be larger. The reduced surface area provides less resistance by having a surface that connects the incoming and outgoing ducts and optimises aerodynamics. When it comes to the protective properties, there are no compromises. Whether commuting or out for a weekend ride, the Omne Air Spin pushes you to go further. Optimal liner density and thicker core protection zones provide ideal all-round protection for everyday use. Meanwhile, ventilation channels and low weight, inspired by our award-winning road cycling helmets, the Octal and the Ventral, deliver optimum comfort and functionality on longer rides. Developed for competitions, the Legit Carbon exceeds all of the certifications for racing downhill and enduro. Providing optimal ventilation due to the two large exhausts working in synergy with the EPS channels, it keeps the head cool at both high and low speed. The ASTM-certified chin guard hosts three wide vents, while durability and quality are enhanced by an injected PU foam, paired with the chin guard and three polycarbonate shells strategically moulded on the EPS liner. Relentless performance and style. The Syntax MIPS combines a touch of European flair with slightly deeper coverage and high-performance features - all tucked into a very slim design. The outer shell is molded from a tough polycarbonate thatâ&#x20AC;&#x2122;s fused permanently to the EPS foam liner using our in-mold construction process to enhance durability and ventilation without excess bulk. A helmet developed by pros, for pros. In the race, top performance counts on every single stage, whether on a steep uphill climb, with its low weight of 220g (for a size medium), or in the nerve-racking top speed of the sprint. The AirBreaker from ABUS supports you on every single kilometre. Thanks to the honeycomb structure of the innovative multi speed design, the AirBreaker always offers the best possible aerodynamics and at the same time ensures optimum ventilation. Featuring LDL multi-G impact technology which can reduce rotational forces by 25% and impact G-forces by 12%, and Composite Fusion, enjoying that thrill of pushing on the pedals as hard as you can in the Therapy is something everyone should experience. When it comes to performing your best in a race or training, an ill-fitting helmet can be a disaster. This is no more: with the micro fit closure system, a small, lightweight dial closure system allowing for precise and easy adjustment for the perfect customised fit. Safety in the city. The Hiri Helmet is Spiuk’s urban mobility solution. It presents a modern and very compact design with a slightly extended front that acts as a visor. The Hiri provides excellent ventilation with its 17 openings and incorporates a removable rear LED light, with up to 72 hours run time. The Hiri improves the cyclist’s visibility with three light modes: continuous, intermittent and sequential. The Bushwhacker Carbon MIPS is an Enduro and trail-specific bike helmet offering stateof-the-art protection and performance. With extended coverage in a lightweight and highly ventilated package, this is the perfect helmet for your trail adventures. The carbon fibre reinforcement adds up to 15% protection improvement. Special features include STACC ventilation, adjustable visor and comfort pads: All wrapped in a five-piece shell technology to ensure superior protection. From long climbs to rowdy, technical descents, the Montaro MIPS helmet inspires your ride no matter where the trail takes you. Its compact shape offers deep, confident coverage, and the Roc Loc Air fit system boosts ventilation while improving fit. In addition to this helmet’s already impressive cooling power, it’s outfitted with hydrophilic, anti-microbial pads that can absorb up to ten times their weight in sweat. Mini Hornit helmets, or LIDs as they’re known, are a bit, no a lot cooler than other helmets! Designed to look stylish and fun (or quietly understated in the case of Stealth), they are fully adjustable, comfortable, lightweight and definitely something kids will want to wear. The helmets also have an integrated LED light on the back, an added safety feature and great when cycling in the evening. New helmet designs will be launching in 2019 with prints including llamas, sloths, unicorns and a chiller spider. •	Super lightweight, coming in at 235g/8.3oz (medium) •	Nine vents designed to improve aerodynamics and cooling •	Quiet riding experience thanks to the reduced wind noise close to riders’ ears •	Redesigned internal channeling to further improve the aerodynamic capability •	Resistex padding: a carbon fabric providing a continuous filament of conductive material based on active carbon. Draws moisture away from the rider’s head. The Bikebiz DIRECTORY 2019 is out now, providing the industry with a musthave guide to the UKâ&#x20AC;&#x2122;s retailers, distributors, manufacturers and related businesses. New Dealers can register online. The setting for the British Museum will be improved by pedestrianising Great Russell Street and the pedestrian environment will be improved around Holborn station. A freight reduction scheme will be delivered in partnership with the local Business Improvement District. Shortlands, Bromley This project will improve travel connections for pedestrians and cyclists to and past Shortlands station, from the surrounding area with new protected cycle lanes on Bromley Road and Valley Road and new pedestrian crossings across the busy A222. New public spaces will be created around the Shortlands war memorial and Shortlands village centre, along with pocket parks and improvements for walking throughout the scheme area, thereby improving the sense of ‘place’. Station Road will be significantly improved for pedestrians crossing with the introduction of a new ‘pocket park’, and a new ‘cycle hub’ will be constructed at Shortlands station. School Streets will make it easier for pupils to get to school without cars, and three low traffic neighbourhoods will be created, reducing the impact of traffic on residential streets. Enfield Town, Enfield Investment in Enfield Town Centre will focus on Church Street, reducing traffic dominance by narrowing the carriageway, connecting Market Square and the shopping centre and making it safer to walk to the train station. Junctions will be redesigned to be safer for pedestrians and cyclists and segregated cycle tracks will be built on Cecil Road, connecting with existing routes built as part of Enfield’s mini-Holland programme. Little Park Gardens and Town Park will be revitalised, and new 20mph speed limits will reduce danger while sustainable drainage on roads will help to reduce flood risk in the area. Old Town, Croydon This project will reduce speeds on the Croydon flyover, reallocate road space to cycling and turn an unhealthy major road into a Healthy Boulevard with new green infrastructure. DATA AND ANALYSIS Brixton, Lambeth This project is focused around Atlantic Road in Brixton, which will be transformed for people walking, cycling and using the bus. Local freight access will be maintained with technology utilised to better manage loading and servicing. The investment will overhaul public spaces, widen footways and add a number of new pedestrian crossings, creating a much more welcoming environment for the area’s many visitors, residents and businesses. The project will build high-quality infrastructure on three key strategic cycle routes: Brixton to Clapham Common, Brixton to Camberwell and Brixton to Herne Hill. Low traffic neighbourhoods will be created in Ferndale and Railton and a new, fully segregated cycle route will link to the Loughborough neighbourhood. Freemasons Road, Newham This project will transform the Custom House Area of Newham for walking and cycling, building on the Crossrail investment in the area. A high-quality cycling link will be built between Custom House Interchange and Cycle Superhighway 3 on Newham Way and a network of local routes will be developed to enable sustainable travel across the wider station catchment area. A new town square and arrival point from the Crossrail stations staircase will be created by reclaiming carriageway space from Freemasons Road. General traffic will be removed from the New Barn Street underpass, restricting it to buses and bikes only. South Bermondsey, Southwark Investment at the Bramcote Park estate will reduce car use by make walking and cycling much easier for local residents, and will connect the area with the future Cycleway 4 and Old Kent Road. Roads will be closed to through traffic, junctions redesigned and streets will be made easier to cross on foot. Links will also be improved to the Deptford Parks Liveable Neighbourhood, for which Lewisham Council was awarded funding last year. Bow, Tower Hamlets Roman Road will become one-way for motor traffic, dramatically reducing traffic. Bus improvements will also be made to better service the town centre. Proposals for St. Stephen’s Road include the provision of continuous footways and the removal of the car park to create a new outdoor space. Proposals for Old Ford Road include better traffic management and will include the introduction of cycle facilities. Modal filters will reduce traffic on residential streets throughout the area, including the road underneath Coborn Street rail bridge.